Be sure to use certified organic blackberries from Prevedelli Farms, available at the farmers markets. Be sure to use certified organic blackberries from Prevedelli Farms, available at the farmers markets at Cabrillo College and the Del Monte Shopping Center as well as many others. In a large bowl, combine 1 cup sugar, cornstarch, tapioca, blackberries, lemon peel and lemon juice. Mix gently to coat. Pour into a shallow 3-4 quart baking dish. Pat ¼ cup portions into flat disks ½ inch thick and arrange evenly over fruit. 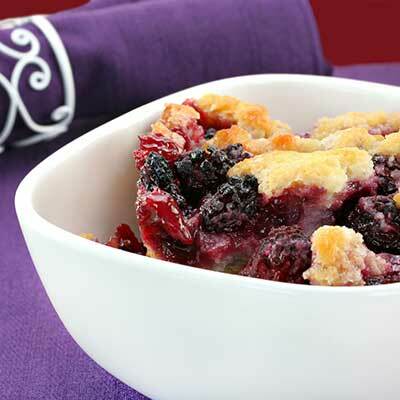 Bake in a 350-degree oven until topping is golden brown and fruit is bubbling 45-to 55 minutes. Serve warm or at room temperature. May also be served with ice cream. © 2019 Santa Clara County Farm Bureau. All rights reserved.